Even though Kyoto is considered as one of the oldest cities in Japan, almost all of its corners and streets come into the border of modernization as there is a looming presence of modern establishments. There is or not, such a hidden old and traditional street where all the winding corners and wooden houses are kept right like they used to be? You may find your answer when immersing in two dull grey streets called Sannenzaka and Ninenzaka in Higashiyama, here you can imagine what exactly Kyoto looked like in the past. 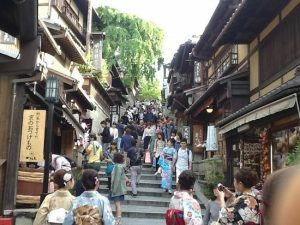 The two streets are usually considered as the approaches to Kiyomizu temple running about 400 meters from the northwest of Kiyomizu temple to the halfway point of Kiyomizu-zaka approach. 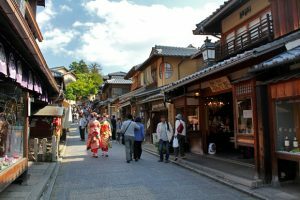 Running through remarkable religious sites including Kiyomizu temple, Kodaiji temple and Yasaka shrine, these charming streets are described as making a trip around Kyoto incompleted without walking through. Visitors today may get used to the meaning of Sannenzaka and Ninenzaka as the slope of three years and slope of two years. A myth tells that if you slip and fall on any one of these streets, you will be dead in 2 years, in case of Ninenzaka and 3 years with Sannenzaka. Actually, Sannenzaka got its name firstly but not a slope of three years as we understand today. San means giving a birth and Nen is the proper name of Hideyoshi Toyotomi’s wife. She lived in Kodaiji temple till 1624 and it used to happen here that she walked over the slopes to Kiyomizu temple to pray for a child. Incidentally, Sannenzaka also means slope of three years then the down slop is also named slope of two years. The surrounding area area is designate as a traditional architectures preservation district. 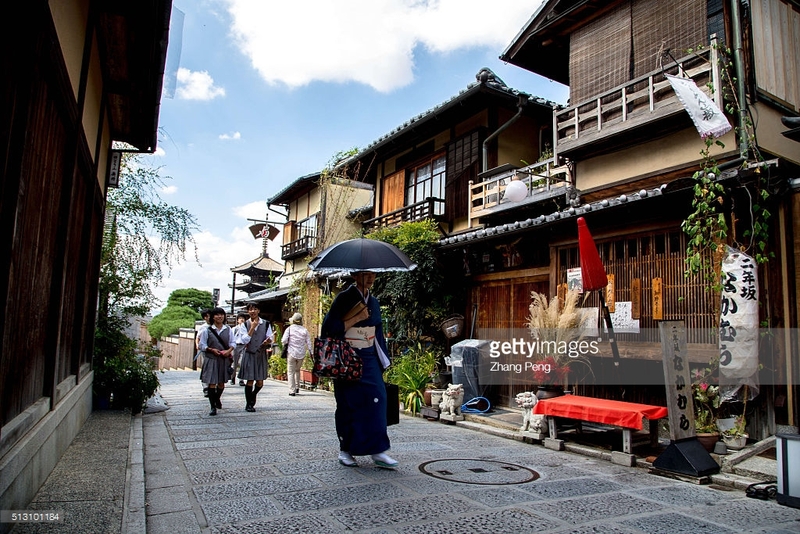 Sannenzaka and Ninenzaka are kind of gentle and narrow sloping roads with flagstones and stone steps lined with traditional wooden storefronts, traditional shops, tea houses and restaurants offering Kyoto traditional items and food. Just take your morning time to visit these street to catch the most good natured moment when there is no crowd, no noise but an extremely silence like a charming girl. Here you can find about 60 shops and restaurants in which 32 ones are souvenir and specialty shops, 18 are restaurants and sweets shops. They sell traditional items like incense, chopsticks and fans, all are hand made. It is also a heaven of food with local pastries, green tea ice cream, mochi balls and baumkuchen cake. There are some special shops for visitors to experience tea ceremony or Maiko or Geisha make over. -From JR Kyoto Station: at Central Exit take bus No.206 from D2 bus stopG then get off at Kiyomizu michi stop. -From Hankyu Kawaramachi: Take bus No.207 bus to Shijyo Street then get off at Kiyomizu michi stop. -From Keihan Gion Shijyo station: take bus No.207 bus toShijyo Street then get off at Kiyomizu michi stop. Take a 5 minute walk from Kiyomizu michi stop. To it’s core, it is a Starbucks, meaning the usual drinks, foods, and souvenirs that are available at just about every other location are here. If that is what you are looking for, than this is an excellent location, although tight in space. Customer service, typical of many Japanese eateries, is excellent. The building itself is a restored tea house, meaning the outside is underrated and you may be likely to walk past it. Seating is unique, from regular patted chairs to wooden benches to tatami mats (remember to take off your shoes before getting on the mats). Most of the seating is on the top floor, and the stairs are extremely narrow. Orders are taken on one side of the building and drinks made on the other. My visit was very quiet, but they seem to have a lot of folding chairs available for more crowded times. The Green Tea Latte here can be made without sugar, unlike American varieties (and is excellent). They do have some Japanese-made souvenirs. Can recommend. This is from an American perspective. The drinks are fairly standard for Starbucks but Japan has cool drinks you can't find in the states. For how busy it gets they get to you very quickly and seats open up consistently. It's a very unique Starbucks and an interesting experience if you find yourself needing some caffeine and a bit of familiarity when visiting Kyoto. The first Japanese-style Starbucks coffee shop in Japan. Coffee is great and has reasonable price. The atmosphere is very cozy. It is very crowded all the time. Nice ambience and cozy shop. Great experience with traditional style of Starbucks shop. The seatings are at upstairs and limited. Best time to visit is early in the morning to avoid long queue and crowd. Staffs was friendly and customer service was good. The second floor seating is realli the wow factor. Every table has its little corner n space. Hard to get seats , set aside enough time to enjoy here..